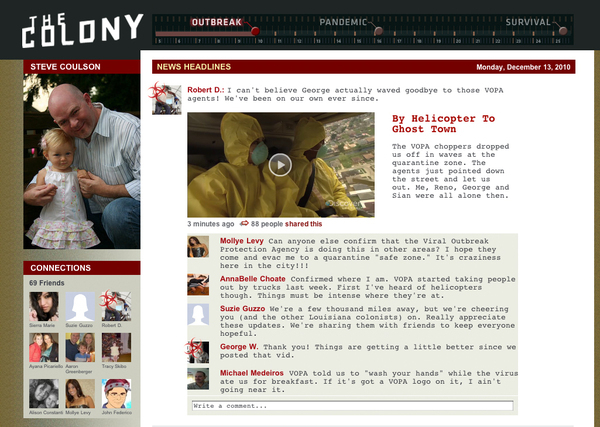 Tying together lifestream storytelling, Facebook Connect, influencer participation and original content, The Colony Experiment was a transmedia prequel for the second season of Discovery Channel's apocalyptic reality series, The Colony. Part backstory, part social experiment, the initiative combined multiple video sequences, photo galleries, and both real and “simulated” web pages to simulate an end-of-the-world social network. Those who logged on via Facebook Connect experienced a highly personalized narrative – a worldwide viral outbreak as told through the eyes of the people that matter most to them; their own friends and family. Original content supplemented the “status updates,” including specially created newscasts. “amateur” videos, photo galleries, blog posts and links. 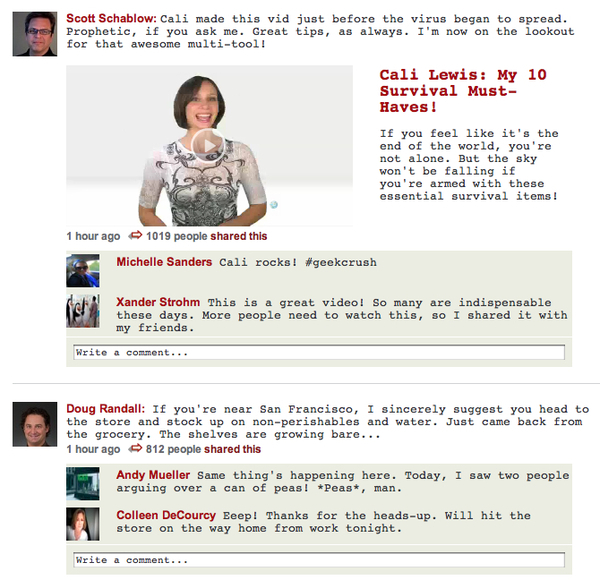 All were embedded in an all-too familiar environment – the “Wall” of a Facebook-like site. Well-known personalities and online influencers also participated by creating original video segments, including “How To’s” and fake PSAs. All were embeddable on blogs and personal websites, and spread virally with dynamically-attached pre- and post-roll bumpers as needed. Combined with an influencer outreach program that saw well-known bloggers such as Violet Blue unboxing doomsday survival kits, the result was a social online experience that received extensive coverage in trade and pop culture press (including Creativity Online's Site of the Day). The experience drew 25,000 visitors a day in the weeks before the premiere, persuading over 2.1m viewers to tune in. The Facebook Connect version of The Colony Experiment is now offline. A non-personalized version can be experienced here.